Like in previous years OSCON, was a great conference to connect with Open Source developers, users and people and companies generally interested in open source. At this point, I would normally share my favourite sessions with you. Not so this year: too little time to see many sessions! Jeremy Fitzhardinge, Ewan Mellor, Joe Keller and I were extremely busy at the Xen.org booth, meeting many many long-time and new Xen users, open source enthusiasts and people wanting to know about what the Xen community is doing. And we gave away hundreds of Xen Fu Panda T-shirts, which were very popular at OSCON, leading to large crowds and lines at our booth. On a more serious note, OSCON was a great way to connect to users we did not know about. Many people we talked to are using open source Xen or one of its commercial distributions in some form. I learned about many innovative use-cases of Xen technology, which was extremely exciting. Of course Xen is used for virtualization, to run internal infrastructure and internal and external cloud services. However, I was surprised about the use of the Xen hypervisor in software development to run virtualized test labs and software production environments. Some users are stretching Xen to the limit running 50+ virtual machines on a PC. The good news is that many of the Xen users we talked to are happy to publicly share how they use Xen, what they have learned and where they think Xen should go in the future. I will be opening the blog and other resources to Xen users, such that you all of you can learn from their experiences. The key lesson I took away from OSCON is that Xen has a large user base, which deserves more focus by Xen.org.Â Another lesson is that our developer community is moving in the right direction: Xen being available in Linux 3 and project Kronos is exactly what many of our users need. Besides 100s of great talks, OSCON is also always lots of fun. My personal highlights this year were: meeting Sen users, the Ignite talks, the Openstack birthday party, spending friday afternoon with Xen users from Brazil and Paul Fenwick’s closing keynote explaining why About Known Bugs and Exploits in our Brains. Thank you to everybody who came by and talked to us! 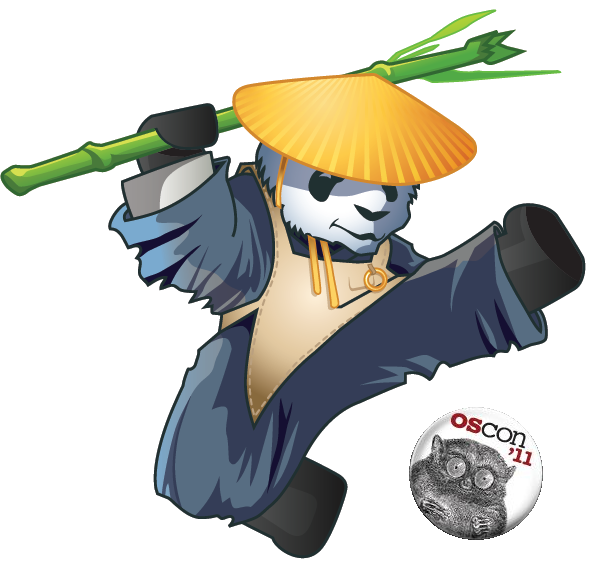 If you visited us and didn’t manage to get a Xen Fu Panda T-shirt, I will make the T-shirt design available via the Xen.org store when XenSummit is over.